Clear and coloured glass painted with brown/black pigment and silver (yellow) stain. The panel shown here depicts the 'Weighing of Souls' and would have originally formed part of a window depicting the 'Last Judgement'. According to medieval theology, at the Second Coming of Jesus Christ the dead will rise and be judged by their sins. This concept of 'judging sins' was very often portrayed in medieval Church art. Christ sits as judge, surrounded by the 12 Apostles. The dead rise from their graves and the Archangel Michael holds a set of scales in which the souls of the risen dead are weighed. The good will go to Heaven and the bad are condemned to the torments of Hell. The Devil was believed to take an active part in the temptation of mankind to sin. 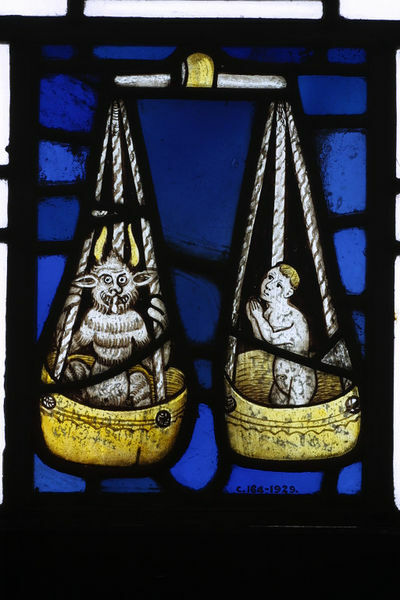 Here, in this panel the devil appears in one of the scale pans as if to tip the balance in his favour and thus condemning the soul in the other to Hell. Sometimes these scenes are accompanied by an image of the Virgin Mary who acts as intercessor between the soul and her son, Christ the Judge. She pleads on the soul's behalf. All of the decorated glass panes on this panel were put together for display purposes many years ago in the Museum. The intention was to illustrate interesting subjects and different painting techniques. The other panes are English or Flemish and range from the 15th to 16th centuries. A pair of scales, painted in grisaille and yellow stain against a background of blue glass. In one pan a naked soul, in the other the devil. (10245/29) Purchase from the Reverend P.A.E. Emson, All Saints Vicarage, Shrewsbury. The vendor stated that this panel came from a church in Sussex (see 5720/29). 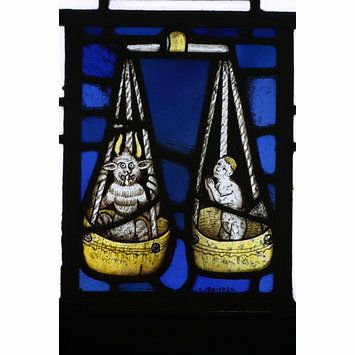 Panel of stained glass with image of the Weighing of Souls set within a background of blue glass. English, first half of 15th cetnury. Framed on a composite panel with C.92:1-9-1930, 931:5-1900 and 2289-1900. Note: In BH.T28B.9.8 there is a box of 33 fragments and a note saying they are part of the above. However, most of the fragments are not medieval - could be a mix of later stained glass used to make a larger panel which included the Weighing of Souls.